Designing With It is a focal feature of each issue, intended to inspire and delight with images and information from a variety of designers and natural stone, tile and decorative concrete professionals. We accept contributions from designers throughout the U.S. and Canada and have a network of natural stone and tile and grout fabrication, restoration and maintenance experts at our fingertips. There are many materials and treatments which will bring a floor to life and lift its status beyond merely something to walk on. 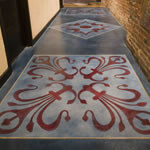 This issue showcases decorative concrete and terrazzo, and you’ll be… well… floored by what can be done in these mediums! Chances are, you don’t even remember the last time you looked at a floor with real attention, except to determine if it was time to clean it. 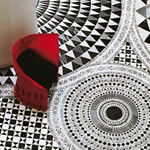 But floors don’t have to be boring! With the right design and workmanship, they can be beautiful... even awe inspiring. Not your grandfather's fireplace! Not only gorgeous, the fire features in this issue are low-maintenance and environmentally responsible. These features can be added to any room fairly simply with the right designer and craftsmen and without the need for cables or utility connections!